How many times have you caught yourself saying, wouldn’t it be great if they could build a hotel that moved. Roll-up the Rotel the new dimension in coach/hotel accommodation bracket. Due to it’s modern sleek design this beauty can rock up a planet saving 1mpg. 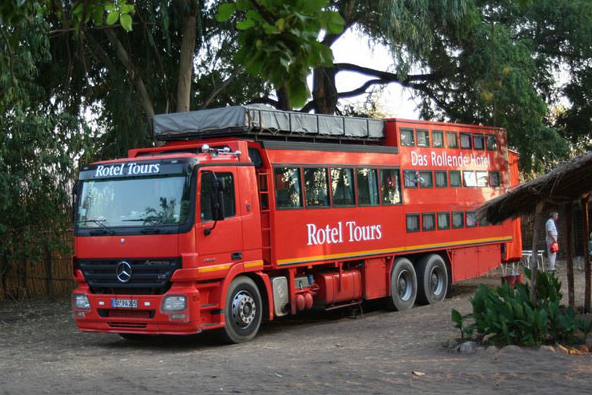 The Rotel Tour group called Das Rollende Hotel (”The Rolling Hotel”) offers a separate room for each passenger. There are several buses, especially designed to tour certain parts of the world. So if you want to go to bed in London and wake up at junction 5 of the M25, reserve your site on the Rolling Hotel and tour Europe in comfort! Genius here. A time-lapse video of a man trapped in an elevator for 41 hours has become something of an Internet sensation after surveillance camera footage emerged after nearly a decade. “After a certain period of time I knew that I was in pretty big trouble because it was the weekend,” said Nicholas White the thicko trapped in the lift. Thankfully the 41 hours have been edited to last just a few minutes now, but it just goes to show you what people will watch. This video has over 1.8 million hits on You Tube. Fancy living out some kind of Total Recall fantasy, then you’ll be after room 14 at the Burnsville hotel, Minnesota. It even comes with his and hers space suits. wow.